US Defense Secretary Jim Mattis reportedly pushed President Donald Trump to get congressional approval before launching new military strikes on Syria. Mattis feared an escalated conflict with Russia, Syria's ally. Trump shook off the suggestion and reportedly wanted a fast and dramatic action against the Syrian regime for a suspected chemical weapons attack there earlier this month. US Defense Secretary Jim Mattis reportedly had reservations about President Donald Trump's unilateral decision to strike at Syria last week, in response to a suspected chemical weapons attack that killed dozens of people there earlier in April. Mattis tried persuading Trump to seek congressional approval before launching the US-led airstrikes, but ultimately failed, military and White House officials said to The New York Times. Mattis reportedly feared escalating a conflict with Russia, Syria's ally — a possibility he likely considered, due to the Russian troops staged at military bases throughout the country. 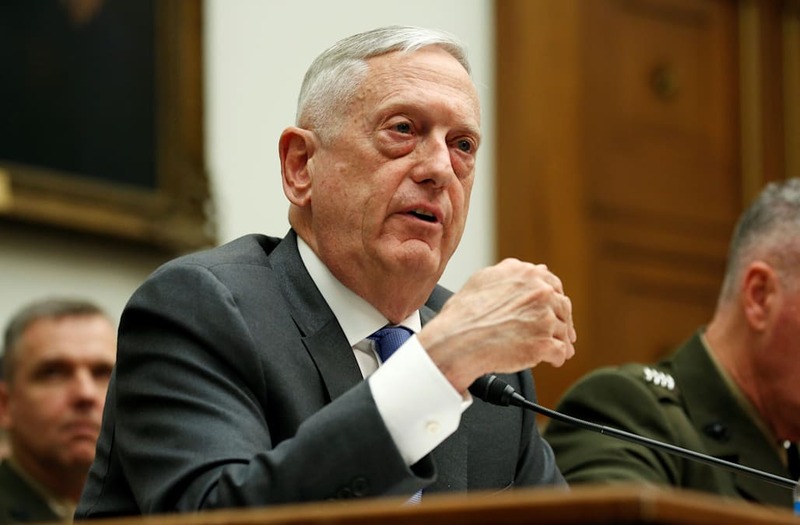 Mattis had reportedly advocated for acquiring congressional approval in meetings leading up to the airstrike, partly because he viewed the public's support of military operations as an essential component, according to people familiar with the situation. Despite Mattis' efforts, the officials said Trump wanted a fast and dramatic action against the Syrian regime — a response that echoed the same tone from the president's previous tweets on the issue. "Russia vows to shoot down any and all missiles fired at Syria," Trump said in a tweet. "Get ready Russia, because they will be coming, nice and new and 'smart!' You shouldn't be partners with a Gas Killing Animal who kills his people and enjoys it!" Trump's decision to narrowly hit three targets — a scientific research center, chemical weapons storage facility, and a chemical equipment storage facility — was considered a compromise. Of the 105 missiles that were launched in the less than two-minute attack, none endangered Russian troops or hit military assets believed to be responsible for Syria's latest suspected chemical attack, The Times said. "They will lose years of research and development data," Joint Chiefs of Staff Joseph Dunford said in a press conference shortly after the strikes on Friday. Following the attack, Russia lashed out and said "the worst apprehensions have come true." "Our warnings have been left unheard," Russian ambassador to the US Anatoly Antonov said in a statement, making it clear that Russia viewed the US action as a direct threat. Trump hailed the US-UK-France airstrikes as a success, but foreign intelligence officials gave a bleaker assessment. "If President Trump had ordered the strike only to show that the US responded to [Syrian President Bashar] Assad's use of chemical weapons, then that goal has been achieved," a senior defense official said in a report published by the Israeli news website, Ynetnews. "But if there was another objective — such as paralyzing the ability to launch chemical weapons or deterring Assad from using it again — it's doubtful any of these objectives have been met," the official said.